Eleven-year-old Leah is on a mission to “empower young girls to define their own b.e.a.u.t.y.” With the help of her mom, Ashley, she’s doing just that. 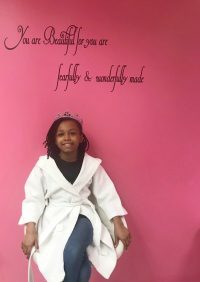 After successfully running GracefuLea Glam Kids Mobile Spa for two years from the back of the family’s SUV, the duo was able to purchase Little Divas Day Spa in Haymarket. Leah and Ashley Turner were excited for the opportunity to keep Little Divas Day Spa going. They were excited for an opportunity to impact more girls on a larger platform. They encourage all girls not to hide behind society’s filter, but to truly embrace exactly who they were created to be. Little Divas Day Spa offers the ultimate spa experience for girls who love being pampered and empowered. Specializing in manicures, pedicures, facials and hair, the spa uses kid-sized equipment in a beautifully decorated space. Inside Little Divas Day Spa, each girl can leave the stresses of adolescence at the door and truly relax and unwind in the inviting atmosphere. No phones, no TVs or any forms of electronics are allowed! What is allowed is music, laughter, friends, and pampering. For more information, visit littledivasdayspa.com.